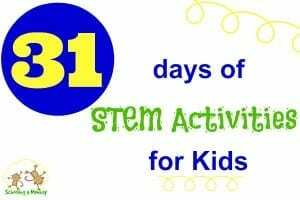 This post is part of the 31 days of STEM activities for kids series. Find all the posts here! For this version, we decided to focus on basic addition and subtraction to increase our skills and fact memory speed. I find even I could use a bit of help in increasing my math facts speed! 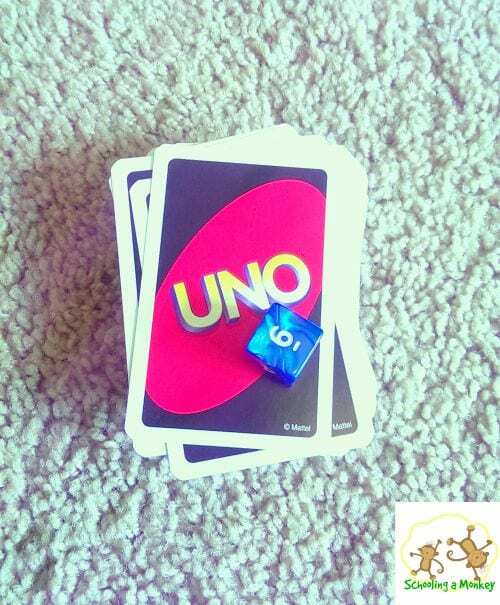 All you need to play the Uno math game! First, remove all cards other than the number cards from the Uno deck (if you want to create rules for these cards you can, but we wanted to keep our game simple. Place all of the number cards face down in a stack. Flip the top card and lay it face up next to the pile of face-down cards. 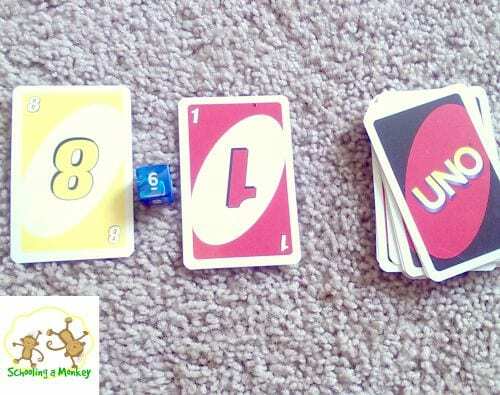 This is what the Uno math game set-up looks like. Player 1 flips a card and lays it next to the other face up card. Player 1 rolls the die. If it is 1-3, the player will subtract the left card from the right card. If it is 2-6, the player will add. If the first number is smaller than the second number, it defaults to addition. If player 1 guesses the correct answer, she takes both cards creating a matched set. Her turn is over, and turn continues clockwise to player 2. Player 2 repeats the same steps for her turn. If a player ever gets the wrong answer, the player to her left gets a chance to steal the match with the correct answer. If she is able to steal the answer from the previous player, she still gets to play her turn as normal (meaning she has the chance to score two matches in one turn). Play continues in this fashion until the one player has 10 matches. 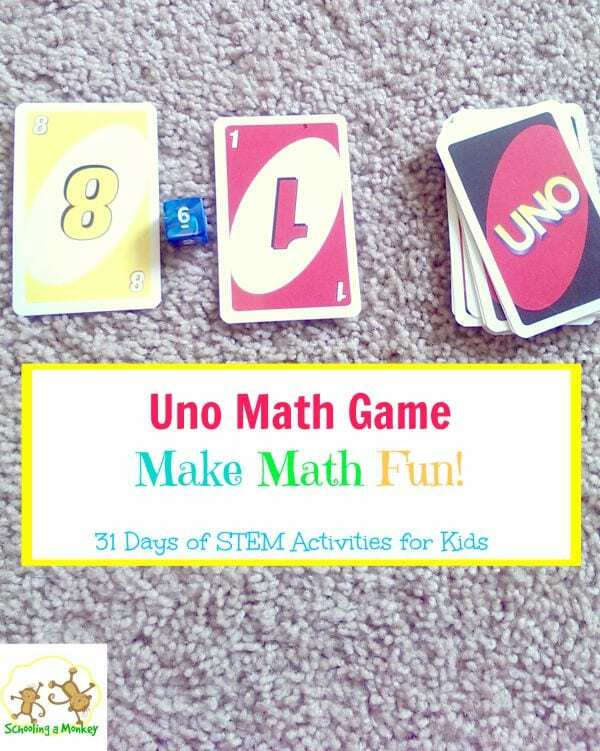 Have you ever played an Uno math game? We found it surprisingly fun! Go here for the other 31 days of STEM posts. Find more homeschooling tips and advice here.